Does Eating Organic Cure Cancer? Hype about the possibility of curing cancer through food, in particular when grown organically, has some people questioning their food choices. However, it's important to realize that while studies are ongoing, there is no scientific evidence that proves eating organically will cure cancer. Cancer is not a single disease but refers to a group of disorders, according to a 2016 Scientific American report. A Boston University School of Health report explains cancer occurs because of damage to cell DNA or hormonal disruptions which cause cells to multiply, bypassing the usual controls a body has. This disease is caused by a number of things including chemicals, radiation, smoking, alcohol, viruses, and being overweight. As many clinicians and scientists have pointed out in the American Scientific Report, there is no single magic bullet to cure cancer. At present, if cancer growth is removed from a patient and does not reoccur during ten years of remission, the patient is considered 'cured.' However, the danger that the disease could re-appear is never over. In fact, Northern Illinois University Biology Chair Barrie Bode is not sure a cure for cancer will be found in the next hundred years. All that doctors hope is to manage cancers similar to heart diseases, so patients live longer and more comfortably. There was no scientific study or credible report that supports the claim that organic food can cure any cancer. A 2012 American Academy of Pediatrics report on organic foods states "there are no well-powered human studies that directly demonstrate health benefits or disease protection as a result of consuming an organic diet." Even support for reducing risk of cancer by eating organic food was scarce, though there is widespread acknowledgement that conventional food has carcinogenic chemicals in or on them and that by reducing exposure to those chemicals, cancer risk could be decreased. As of 2012, there were no studies to separate and establish benefits of switching to organics from the other factors that influence a person's health. Moreover, only a short-term switch to organic food may not show clinically significant benefits according to a Washington University study (page 2). However, by choosing organic food it has already been established that "a 94% reduction in health risk" can be achieved (page 6). This conclusion is pertinent for all diseases, not just cancer in particular, however, and few studies are available to back up this assessment. Backing for cancer protection from organic food comes from a 2014 international research report based on 343 studies which found anywhere from 18 to 69 percent higher rate of antioxidants in organic foods. Some previous studies have shown certain antioxidants can help prevent cancer or slow its growth, but newer studies haven't replicated those results. The American Cancer Society (ACS) however is not prepared to concede that organic products will even lessen cancer risk, let alone cure it, as this is "largely unknown" or not established through replicated studies. The ACS acknowledges that various carcinogens can be present in food due to use of pesticides and herbicides to cultivate crops, and growth hormones and antibiotics for animals. Fifty percent of men and 30% of women in U.S. are likely to develop cancer in their lifetime, "and pesticides are part of the reason" points out Pesticide Action Network (PAN). The USDA regularly declares levels of pesticides are at or below safe levels as in 2016. But a Food Safety Report notes that USDA tests levels only for individual pesticides, and a fruit or vegetable can have more than one chemical on it and the total level of chemicals may not be safe. Many pesticides are classified as carcinogenic by EPA, and a 2105 WEBMD report finds that Glyphosate is also "probably carcinogenic." Therefore, it only makes sense to eat organically to reduce the exposure risk to pesticides potentially found on conventionally grown foods. This also may be why some people believe eating organically (and avoiding the potential carcinogens from pesticides) could provide a cure. There are many anecdotal stories regarding cures from eating the right foods but are not backed by research or trials. The ACS, for one, notes that "(c)oncern about the possible effects of food additives on health, including cancer, is one reason that many people are now interested in organic foods." While not specifically linked to eating, there are stories like the scientist who recovered from breast cancer by changing to a vegan diet and the person who reversed metastatic skeletal cancer by eating "good fats." There are websites which claim food can cure cancer, too - for example one promotes raw food without providing any scientific backing or reference for their claims. It only follows that as organic foods gained traction, people would naturally begin to think they can cure cancer despite a lack of scientific evidence. Research in different foods, such as organic versions, as cure for cancer is still in its infancy, and many laboratories in the US are experimenting in this area. Nobody is recommending food yet as a cure or even complementary treatment for cancer. 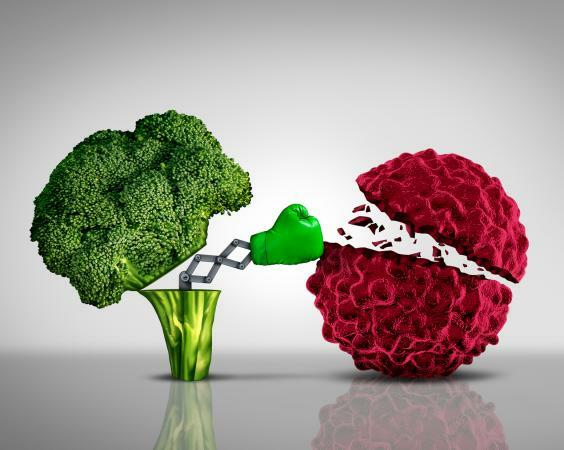 It is not proven that organic food can cure cancer or even reduce risk. However, healthy foods, like dark leafy vegetables and bright berries, whether conventional or organic, are universally considered useful in reducing the risk of cancer.